The International Committee of the Red Cross (ICRC) has warned of an impending humanitarian catastrophe in north-eastern Sri Lanka. 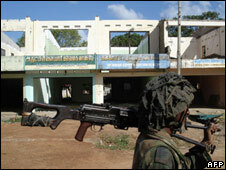 Up to 150,000 people may be trapped in the area by fighting between government forces and Tamil Tiger rebels. The ICRC has reiterated calls for a mass evacuation of civilians and for far more aid to be allowed in. The ICRC's Jacques de Maio said the situation was one of the worst disasters he had experienced. Mr de Maio, head of operations for South Asia, said it would be possible "quite easily to avoid all of the unnecessary suffering and death which is taking place right now, and to allow for an immediate and massive evacuation". He said it should also be possible to allow "significant and meaningful humanitarian assistance" into the war-affected areas. Some aid has arrived in recent weeks, but the government has allowed in far less than is needed, the ICRC says. Government estimates put the number of civilians caught up in the fighting at about half the level calculated by the ICRC, but the truth is that nobody really knows. Aid workers have spoken of desperate scenes where there has been contact with those civilians. Thousands of people have run from the jungle towards the coast, where there is no clean water or shelter. In one place, the ICRC has succeeded in landing a boat to take off the wounded. About 2,000 people have been taken off this beach, but many more have been left behind. Mr de Maio described the complex moral choices being made by those deciding who should be saved. "When we reach the beach with the ferry there are exchanges of fire, there are thousands of people on this beach, they are stranded on basically sand and salty water," he said. "When we evacuate them, our people have to select the ones eligible... meaning we have to exclude many others. And this is very difficult to handle for people on the ground." Tamil Tiger rebels have been unwilling to let the civilian population leave because they fear that would leave the government with the opportunity to level the area with more ferocity. The ICRC has been lobbying European governments to exert pressure to improve the humanitarian situation, as the long and bloody struggle for Sri Lanka moves into a decisive phase.